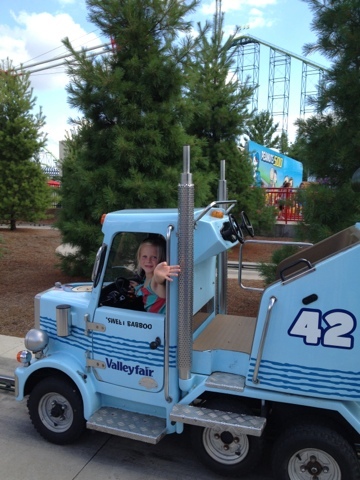 Yesterday was our annual trip to Valleyfair...Minnesota's version of an amusement park! My kids look forward to this day ALL. YEAR. LONG. Seriously. The day after our Valleyfair trip, at least one of the kids will pipe up with, "Mom, when do we get to go to Valleyfair next?" 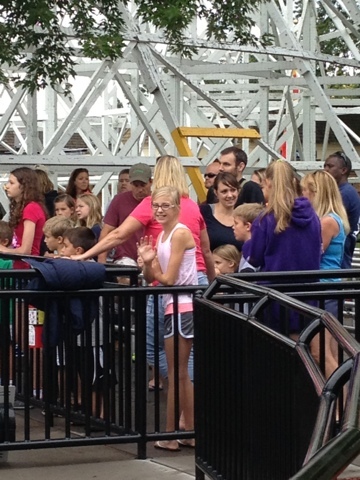 As time has evolved, I came to realize just HOW MUCH my husband loathes rides, and I stopped hounding him to go on the giant roller coasters...it might've been the year he was adamantly refusing to go (because he didn't want to be "forced" on any rides) that made me realize NOT everyone enjoys rides, even after they "try it just once and see!!". Needless to say, it was another successful trip! We came home with exhausted, sticky kids with sun kissed cheeks and awoke to rush out the door for swimming lessons. I daresay this has been the busiest summer on file, yet. Now, to get ready for our family reunion weekend this weekend! I will need approximately 87 days of straight sleep to catch up, after this week! I'm opposite of you and more like your husband - tilt a whirls and so forth, I'm good, but those roller coasters and free falls... forget it! Now, my husband, LOVES the rides that you like! Back To School! Then...and Now!